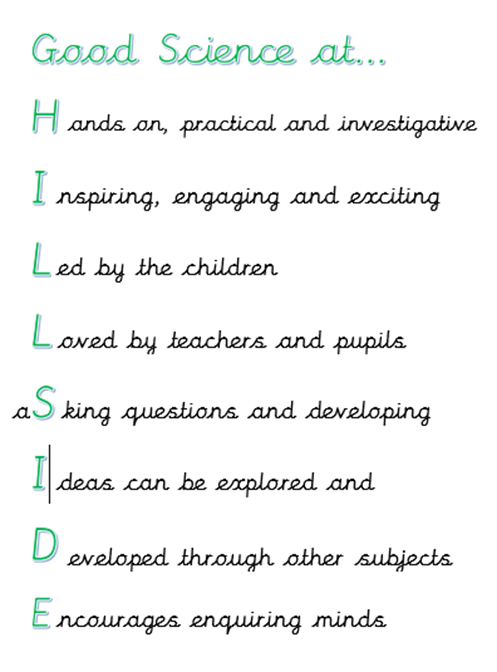 We aim to stimulate the curiosity of every individual at Hillside, developing a thirst for learning in finding out why things happen in the way that they do. We teach methods of enquiry and investigation to stimulate creative thought. Children learn to ask scientific questions and begin to appreciate the way in which science will affect the future on a personal, national and global scale. The following are the principles of Science teaching at Hillside, decided and agreed by the children and staff on the way we feel Science should be taught to everyone. These principles are displayed in every classroom as part of the Science working wall. Please click below to view our long term plan. The objectives for Science in KS1 and KS2 are clearly set out for each year group in the National Curriculum. 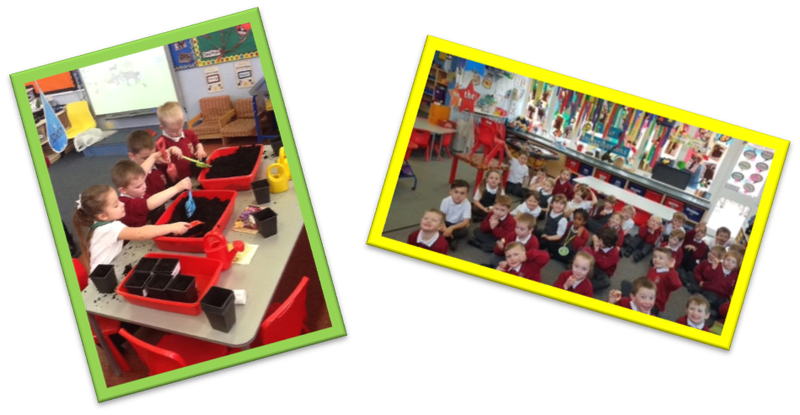 We teach Science in EYFS as an integral part of the topic work covered during the year. Ongoing scientific experiences and opportunities are planned from the objectives set out in the Early Year Framework which underpin the curriculum planning for children age 3 – 5. Knowledge and Understanding of the World ensures children develop early scientific ideas and processes through hands on activities, practical exploration and outdoor experiences. ICT enhances our teaching of Science wherever appropriate in all key stages. The children use ICT in a variety of ways such as researching using secondary sources, word processing, and presenting information via PowerPoint. Collection of data using data loggers and the use of scientific apps such as Virtualitee and plantsnap. As part of each unit of science, children are introduced to significant scientists from the past who have contributed and worked in that particular area of science. They learn about the impact individuals from the past have had on developments in science and that scientific ideas are constantly changing as time passes. We place great importance on educational visits and visitors to enhance the Science curriculum. These visits allow our children to make connections to what they have learned in class and secure their understanding of the topics through first hand experiences. Children in each year group experience a visit over the year which is Science themed. These may include visits to Hoo Farm, Peak Wildlife Park, Jodrell Bank, Coombes Valley Nature Reserve, The National Space Centre and the Museum of Science and Industry. Assessment in Science is carried out both formally and summatively in order to gain an understanding of the children’s achievements and the next steps for their progress. Children are assessed during topics on both their subject knowledge and also their ability in working scientifically. Assessments are carried out in various forms, including observing, questioning, discussions and end of unit reflections, as appropriate to the age of the children and the nature of the topic. A new assessment system was introduced in September 2017 for Years 1- 6, which has been taken on board by staff and provides concise information about each pupil within school. These new assessments provide a continual ongoing picture of the progress of individuals in a way that is effective, relevant and manageable to all staff and allows tracking of each individual child’s progress as they move on their journey through Hillside. In addition to the EYFS and NC objectives being delivered to the children, there are many other enrichment opportunities provided to enable children to engage with science and to promote and enthuse the passion for science across the school. These include: science themed trips, science enrichment visits for the more able and talented children, involvement in national science projects and programs, an after school forest schooling science club and a science fair for all pupils during science week. Science ambassadors plan and carry out their own demonstrations and investigations for the KS1 to be involved in, in order to enthuse and excite them and encourage a love of Science. During Science week in March, children from Year 5 and 6 experience the Big Bang Science Fair at the NEC in Birmingham and also the local event held at Staffs University. During the day they get involved in a wealth of experiences involving building and racing robots, a silent disco, investigating light through gummy bears, handling a range of critters and STEM challenges.